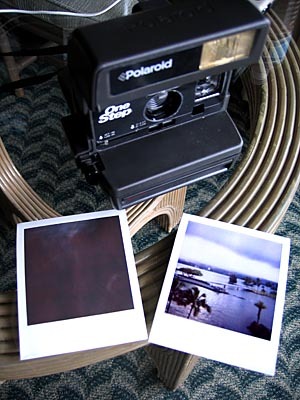 Okay, I said this Polaroid set-up was sweet but I started to think otherwise. I popped the film pack into the camera and immediately the darkslide started to eject…yikes! I slapped the front part close fast to not expose any of the film and the darkslide slid out of the front of the camera’s slot. So I figured I was ready to shoot. 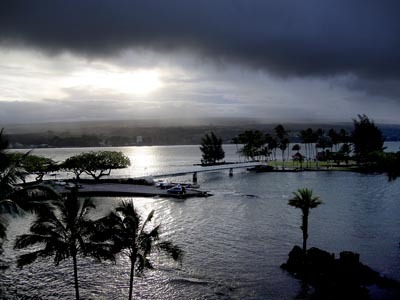 I composed a shot from my hotel of Hilo Bay, the red light on the camera indicated it was ready to fire, I pulled back the shutter and…nothing. I pulled again, I pulled it back about 15 times with no results. I closed and opened the camera a few times, nothing. Bleh. So I figured it has either been sitting around too long or I loaded it wrong (no instructions but I’m a pro right?) So I did what anyone would do, I slapped the thing around a few times and nothing. So I gave a it a good hard whack and it took a photo by itself and spit it out (the polaroid on the left) a shot of the wall or something. So then I went back out and shot the photo on the right. I guess it’s working now. I don’t normally treat my camera gear like this, only cameras that cost $5 and made of ABS plastic. Here’s the same shot with my little digital camera.